North Carolina Board of Public Charities Annual Report of the Board of Public Charities of North Carolina, 1908. 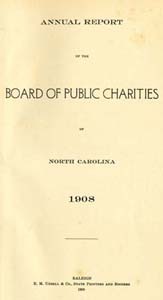 Annual Report of the Board of Public Charities of North Carolina, 1908. Raleigh: E. M. Uzzell & Co., 1909. Mental illness -- North Carolina -- Prevention.